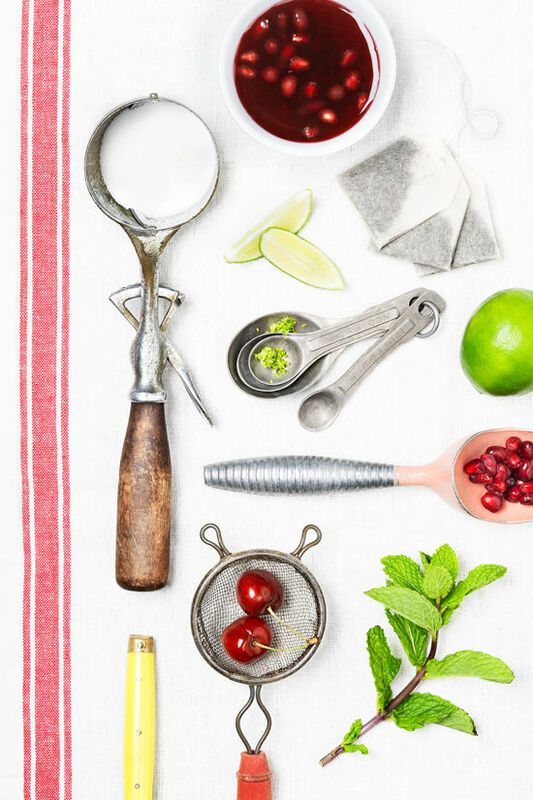 **You can really use any juice and fruit pairing that works for your flavor palate. Some options could be mango-pineapple, blackberry-port wine, blood orange, or strawberry-lemon. And the simple syrup can be adjusted as well. Use it plain, or try different flavored teas, fresh herbs, or vanilla bean. The possibilities are endless. 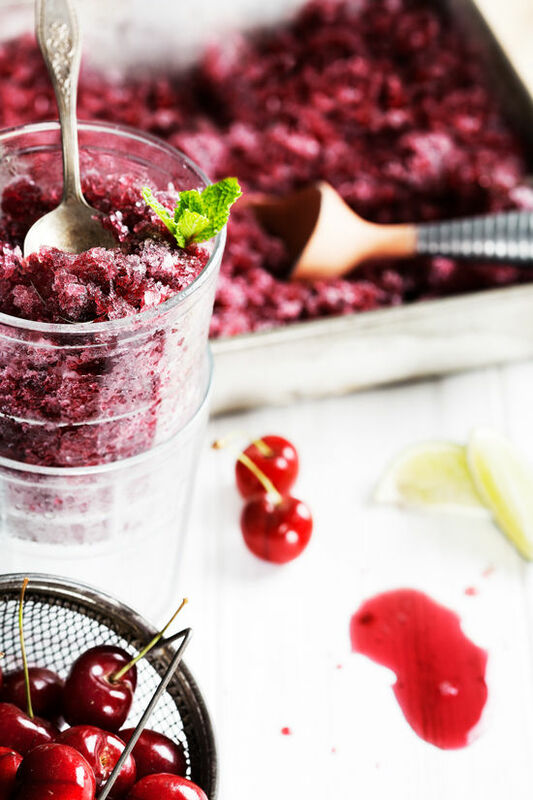 Lastly, this can be served as a granita (think shaved ice) or as a silky, smooth sorbet. Both are delicious! • In a quart saucepan, bring water to desired steeping temperature (green tea = simmering, black tea = boiling). Turn off heat. • Add 4 springs of mint and tea bags, steep for desired time (green tea = 2-3min, black tea = 4-5min). • Remove mint and tea bags. • Bring liquid to rapid boil. Stir in sugar until dissolved completely. Remove from heat. Place remaining mint in simple syrup liquid. Steep 5 min. • Add lime zest, let liquid cool completely. 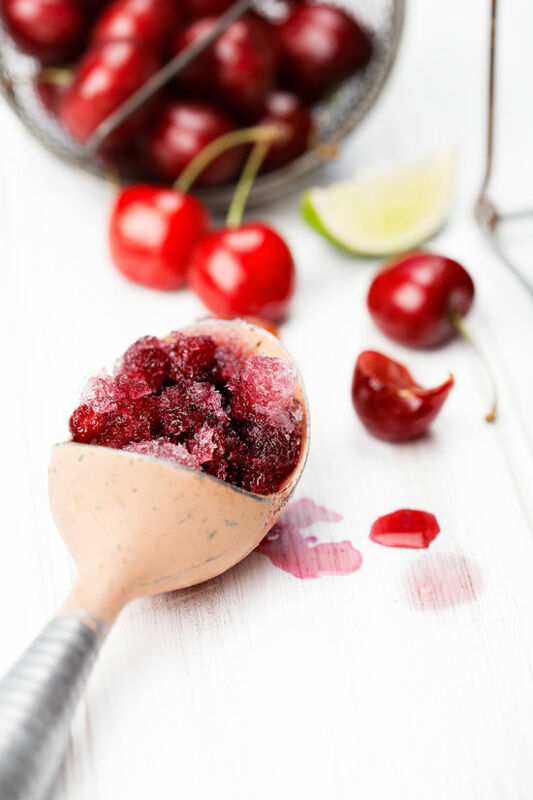 • Whisk in lime juice and pomegranate-cherry juice. Add pomegranate seeds. so what do you think, will you be giving this one a shot? I’m definitely going try this in the summer when I have guests over. Great refreshing, healthy little treat for a hot summer day! Oh this sounds super yummy! 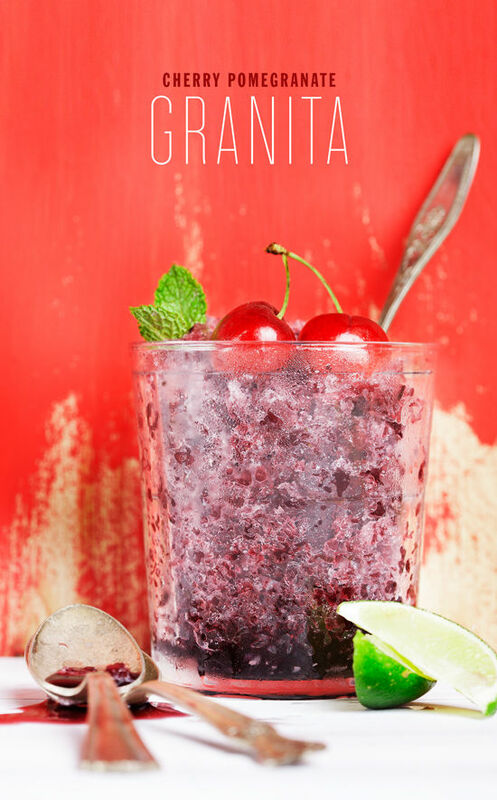 I hope cherries make it to the north end of our island soon so I can try this recipe. Perfect for this Summer heat! 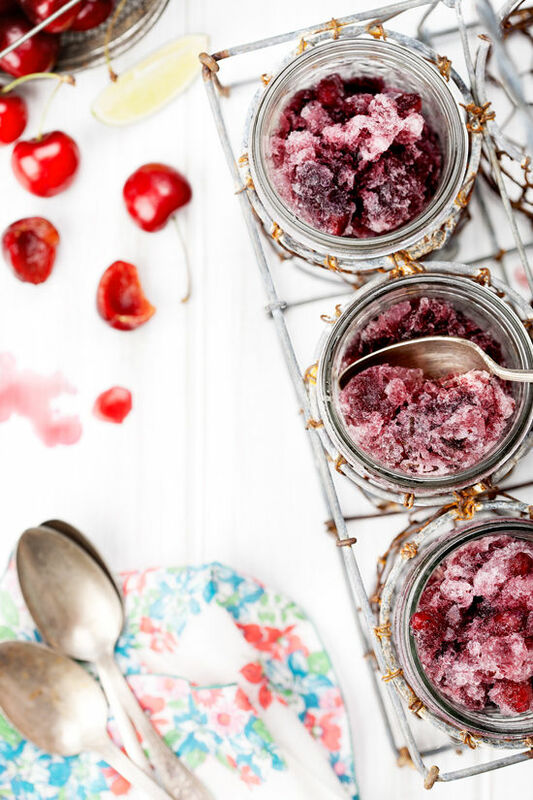 I adore summer cherries and this looks so good! This looks delicious and perfect for summer! I will definitely have to try it. The photos look so pretty and the drink looks awesome too. Hey how great. Just the one I need for a party this weekend Love the color plus taste! Hmmm this looks deliciously refreshing! Now all we need to add to this recipe is a long hot summer day… come on summer! This looks sooooooooooo good!! Mmmm.. I want one now! Wow! Yum! These photos are so bright and cheery too. Hello, Neat post. There’s a problem along with your website in web explorer, might check this? IE still is the market chief and a big section of folks will omit your excellent writing due to this problem. with approximately all significant infos. I’d like to peer more posts like this . Hi there, i read your blog from time to time and i own a similar one and i wass just curious if you get a lot of spam feedback? If so how do you prevent it, any plugin oor anything you can advise? I get so much larely it’s driving me crazy so any help is very much appreciated. I experience discovered great blogs in addition to been through some,your work is always spectacular.Caps off for a enthusiasm and additionally frankness.Do continue to keep all of us informed in future as well.